Discussion in 'Map Factory' started by Fr0Z3nR, Mar 27, 2011. "You must construct additional granaries!" 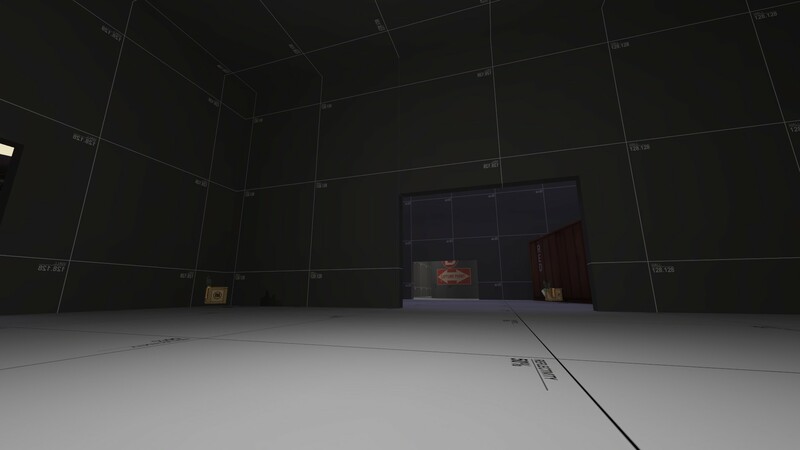 Introducing CP_Hayloft! My "I know what I'm doing now, so lets get serious map." 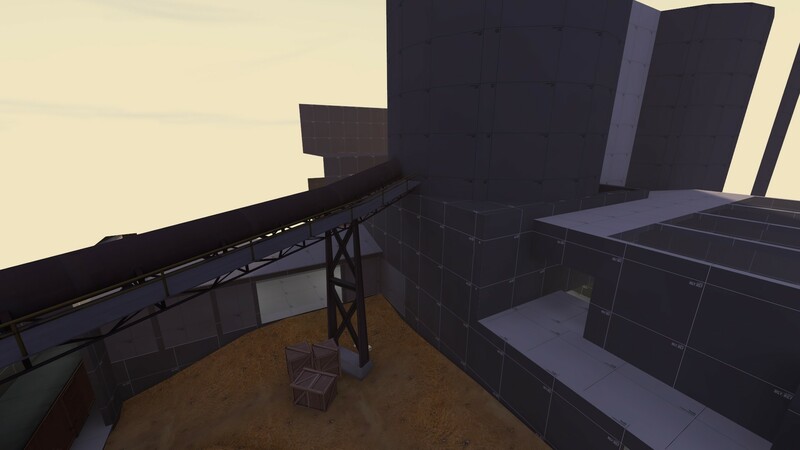 A 2 CP Attack/Defend Map, Hayloft (and DBP's Great plains) is bringing back the granary theme! It keeps the flatness of 5CP granary, but also adds a couple of interesting capture area's. I believe this will -hopefully- be an improvement on the granary theme and the granary map in general. Same heavy from CP1 to CP2 is 38 seconds. For this, I will adjust spawn times accordingly based off testing and my own thoughts. The Control Point being on a haystack doesn't make much sense. Also, there should be more places where players can reach the pipes and use them to traverse areas they otherwise can't. It wasn't what I originally intended, but if I can find a way to do it easily, I will do so. Yay more granary! DBP, I swear I did not steal your point idea. I like the CP on a haystack. I have been doing some rough short tests with bots, the haystack is working okay so far, minus the fact that red is a bit dominant on it, and the bots only take one route, not any of the flanks.... SO... I can't get a good judge on if it is working well or not. I hope to release later tonight or tomorrow. Just fixing textures, a couple of props, lighting, adjusting ammo/HP placements etc. Can I have the name and make it into a -hopefully- awesome CP map? If you say no that is fine and will change the name. I don't get what your saying absurdist. You mean, make the flat brush into straight ground? Did some testing with bots, so the rounds work. The Bots seem to be at a 50/50 Win to Loss Ratio, so take that as you will. I don't think its a good thing, but testing will tell. >First thing I did was adjust cap time of CP1. It will be 35 seconds, the second point remains unchanged. > I've decided I don't like Capture Point A, nor the transition leading up to A, so I will be tearing up that area and redoing it. I'm thinking a building (blue themed most likely) that will have a few train tracks/trains loading area, and for the point, have it sit in an irrigation canal Under a bridge or something. I'm trying to play with the theme here, so if I don't like it. I'll change it. >This with also include a forward spawn for blue. > if there is anything else you didn't or did like about the map, toss it up here, I would be very grateful for any feedback, positive or negative. I want this to be a great map so I'm not rushing it. I'm taking my time and will hopefully produce something fun. Dogbread invades the hayloft. The infestation of Dogbread is lead by their demonic ruler. Not really, but there is some demonic dogbread now in a2! - New Capture point A, under a bridge crossing an irrigation channel. Point B the same. - Broke up sightlines that were already present/arose. - Blue now has a Foward spawn which is an exit only spawn. Opens up after the capture of point A. - Fixed the ability to see through the bottom of Point B and some displacement issues. - Added Rexy's Dogbread for Alpha stage hilarity. I didn't like the original first point, so I redid it today, and I like this one a bit more. So hopefully no new massive overhauls. It is UNDER the bridge, I tried to label it the best I could. Point B is still the same. Finally, Thanks to Rexy for his dogbread models! EDIT: Realized some of the shots are outdated, when I get time I will update them. As Blu I wanted to get up here a lot as non-jump classes (Heavy, specifically). I dunno if you wanna change the final point around much, but lowering this and adding a short staircase or ramp might be neat. Two full ammos, very close. If you think Blu needs a forward spawn, I think you ought to do this. Reason being that when you spawn on a 2cp map, you don't want the attackers to circumvent any last lines of defense that Red might have. Remember the round where a sentry stopped Blu for a while? If Blu came out of the building above the current forward, most players would have walked by it just fine. Putting it here allows you to mimic Gorge (like I do in Desertion), and I think Gorge does things pretty well: only jump classes can get back in and it's before the point itself. This gives Blu a small but welcome advantage at the area they already own. Like I said before, this is kinda more Dustbowl-esque than Gorge-esque, I think, so you may not even need a forward. The thing about putting one there is that Blu probably doesn't even need it. One thing I forgot to take a picture of: I'd suggest moving the crossbars and sheet metal on the silo above the 2nd point from the side to the red side. It seemed really easy for people to run out shooting, which I don't think is great; you ought to have some kind of buffer between spawns and the point, even if it is small. 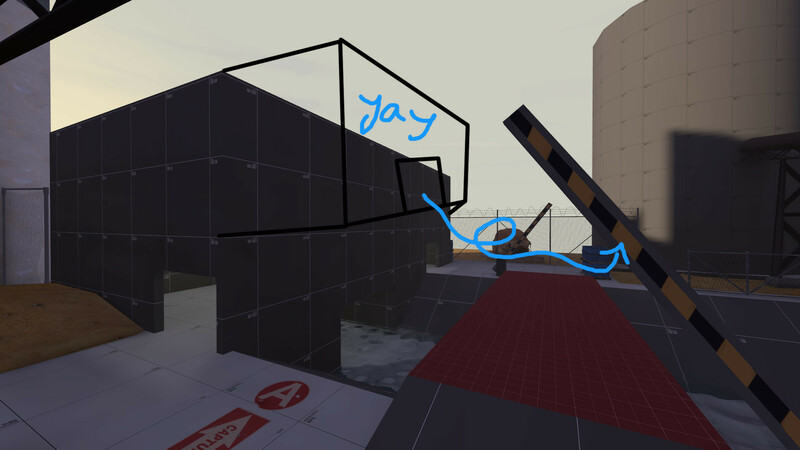 I don't know yet if I want to add the ability to walk on the conveyors yet, but it will be taken into consideration in later alpha's. I didn't notice the two close full ammo packs and will adjust that for the next version. I think I'm going to use a forward spawn for now. If I find it useless later on, I'll just remove it. EDIT: Also as post test notes: I'll move the point to ONTO the bridge, and will do some finagling to keep that balanced. The foward spawn will be what yyler suggest or near to that area. Though, will keep the grateings for decoration later on. Dogbread will remain. I will rotate the map to allow for better lighting and less shadows. New version out for everyone's enjoyment. Now with 100% more hats! - Added some preliminary textures. - Fixed some clipping issues. - Added some "character" to the final point. Don't let anyone tell you that putting the point on the hay pile is a bad idea. I'm so jealous of that idea its physically hurting me. Thanks. The map is kinda based around that whole point, so it won't be changing anytime soon. Was looking at the map tonight with Walka, looks like it might be fun to play. These are some things I saw while looking at it. You can get up on these outcropping around the silo on the final point, I don't know if you want to give access to height there or not. Just wondering where these models came from, they're kind of random and seem really out of place. At the same time, it does make the map a little easier to remember. I don't know if I really like these raised gates. They're an interesting feature, but I can see hitting them while jumping or just having my jumps be restricted by them end up being really annoying. Maybe make them vertical so they don't have as much of a footprint on the map, or just make it so you can just jump right through them. It is TF2Maps inside joke.